CIO Applications Europe magazine describes itself as "the single most successful initiative Pan-Europe to advise and guide decision-makers regarding the latest in the fast-evolving technology landscape." 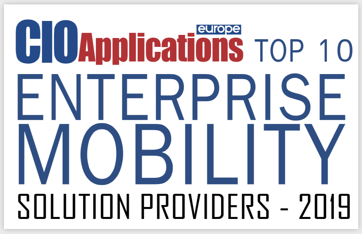 "Amidst growing software and hardware complexities, privacy concerns, and mobile management compliance, various enterprise mobility solution providers are coming to the forefront to deliver top-of-the-line solutions for users facing the complex world of enterprise mobility," the editors wrote about the vendors making this year's top 10 mobility list. "Enterprises are constantly looking for ways to improve business performance and workforce agility through a robust and customizable enterprise mobility platform." The accolades from CIO Applications follow our announcement earlier this year of our new Mobile-X service, the industry's first mobile service to put control over mobile communications directly into the hands of enterprise IT. Tango Networks Mobile-X creates a Global Private Mobile Network (GPMN) that is exclusively controlled by an enterprise customer. This means that your IT managers can directly control mobile voice, messaging and data services like never before. One consistent mobile subscription for a customer's employees worldwide. Native communications on employee mobile devices driven by the enterprise’s unified communications platform, for Mobile UC without requiring hard-to-use VoIP apps.